Ailsa Read’s exhibition The Witches Walk takes for its subject the ‘Pendle witches’, the nine women and two men tried and executed in Lancashire in 1612. These eleven, who lived around Barrowford in the shadow of Pendle Hill, were accused of practising witchcraft. They were interrogated, marched fifty-one miles to Lancaster castle and held in a tiny cell in which one of them died. After ninety-one days, a visiting judge passed their sentence and they were hung on Lancaster moors, then burned so that no trace of their bodies remained. Burning was both symbolically important (referencing the fires of hell), and served a practical function: no shrine was to be made here, no relics to be discovered. Beggars and pedlars of herbal remedies for the sick and worried, the so-called witches’ medicinal skills were both valued and feared by members of their communities, as was often the case. The executions took place under the puritan Reformation that swept through England under James I, but theirs was less a religious persecution than a demonstration of institutional and ideological power. Witch hunters were employed by the church and the state to rid communities of threats to power, and witch finding is biblically sanctioned (‘Thou shalt not suffer a witch to live’, Exodus 22: 18). The exhibition is comprised of eight laser-cut photographs of Read’s face, each wrapped in a cotton shroud; a map of the journey she took on foot to recreate the witches’ walk and mark in present time their past steps; and a photographic account of this journey. Ten images show the thumb stick and white cotton flag that the artist carried with her, placed in significant locations along the way; on barnacles, bridges and milestones. The witches had no shrine, but the trees, walls and rivers along their route witnessed their passage. There is also a book accompanying the exhibition called 91 Days days which contains charred, laser-cut pages that, when turned, leave ghostly and accusing traces of ash. To better connect with her subject matter, Read undertook the walk over six days. She describes this as a hard, lonely journey. At one point another walker asked if her stick was a surrender flag. The works made for The Witches Walk were also exhibited at Lancaster castle on the 404th anniversary of the execution, during which time their original prison cell was open to the public. The intention of the executioners may have been to eradicate them from history, but Read reminds us that history is a living thing. With a longstanding research interest in the religious persecution of women, the artist (a former student at Leeds College of Art, now undertaking a practice-based PhD at Huddersfield University) has focussed on the Pendle witches as a representative story that brings us face to face with a past that has frightening echoes in our present political moment. In some stories of women’s persecution, martyrdom or sainthood is the outcome. However, Read is not interested in the elevation of women who have been misunderstood, murdered and mortified by the very same dogma by which their lives were. Instead photographing herself in different guises, she creates black and white images on fabric and uses an industrial laser cutter to burn into the faces. This a deliberate act; a random process in keeping with the unannounced violence that power can inflict. She uses her own face because these women were too poor to have any visual record left of them and because they represent every woman – all women. Read’s use of cotton references the women’s embodied presence in Lancashire’s material culture. Through these processes and materials, Read creates a memorial to the fragility and vulnerability of these individuals, physically destroyed but still present. Read’s message is stark and quietly accessible. The lack of apostrophe in the title of the exhibition is intentional: the walk did not belong to these witches, they did not choose to trek fifty-one miles to their deaths. They are not pointy hat and broomstick witches; they are like you and me. Ailsa Read: The Witches Walk, Vernon Street Gallery, Leeds College of Art, 10 February – 10 March 2017. 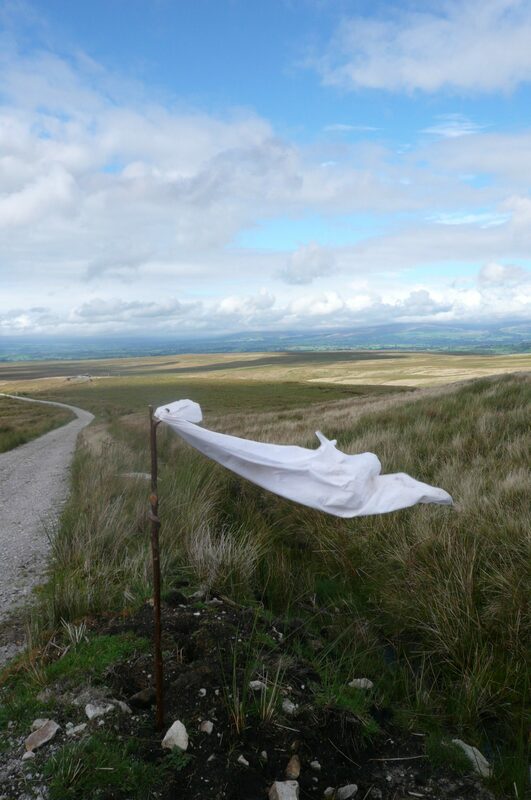 Image: Ailsa Read, ‘The Walk from Barrowford to the Gallows at Lancaster, July 2016’, courtesy of the artist.